"Brims with charm and compassion." "How is it then?" Peaches asked, turning on her stomach to face me. "It's like sky. If you keep driving and driving, gas will run out, right?" "That's why we gotta go to the gas station." "Yep. But have you ever seen the sky run out? No matter how far we go?" "No, when we look up, there it is." "Well that's the kind of love Daddy and Mama got for us, Peaches--love like sky." G-baby and her younger sister, Peaches, are still getting used to their "blended-up" family. They live with Mama and Frank out in the suburbs, and they haven't seen their real daddy much since he married Millicent. G-baby misses her best friend back in Atlanta, and is crushed that her glamorous new stepsister, Tangie, wants nothing to do with her. G-baby is so preoccupied with earning Tangie's approval that she isn't there for her own little sister when she needs her most. Peaches gets sick-really sick. Suddenly, Mama and Daddy are arguing like they did before the divorce, and even the doctors at the hospital don't know how to help Peaches get better. It's up to G-baby to put things right. She knows Peaches can be strong again if she can only see that their family's love for her really is like sky. Leslie C. Youngblood received an MFA from the University of North Carolina at Greensboro. A former assistant professor of creative writing at Lincoln University in Jefferson City, she has lectured at Mississippi State University, UNC-Greensboro, and the University of Ghana at Legon. She's been awarded a host of writing honors, including a 2014 Yaddo's Elizabeth Ames Residency, the Lorian Hemingway Short Story Prize, a Hurston Wright Fellowship, and the Room of Her Own Foundation's 2009 Orlando Short Story Prize. In 2010 she won the Go On Girl! Book Club Aspiring Writer Award. Born in Bogalusa, Louisiana, and raised in Rochester, she's fortunate to have a family of natural storytellers and a circle of supportive family and friends. 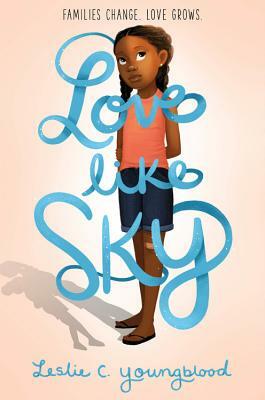 Love Like Sky is her debut novel.